Welcome to the first Wordless Wednesday at my new blog! This photo will be known as the beginning of the end. I was all like, "Look out 47! I'm coming for you at midnight!" and my friends and I were headed for Oktoberfest for my birthday. Luckily, I didn't break my hand again that year. Little did I know it would be my last "normal" year. THIS next picture will forever be known as the last weekend my life was normal. This one is from June 2017. It's right before all of my not very fun symptoms started to appear. Luckily, it only took me about 4 months to kind of, sort of, figure out what was going on and put some protocols in place to deal with it. Don't take everything too seriously, because life is short! All I can say, looking back from 68 is somehow most of us survive it (if not those around us LOL). LOL! I know, we all have to, right? Glad to hear from someone who has survived. Thanks for stopping by! I'm sure I will, steve. :) Thanks for your encouragement and for stopping by! I went through this in my early 50s. Not fun at all. Thanks for visiting and linking to my Wordless Wednesday. Thank you for your kind comment! I love hearing from you guys because I know that there is hope. :) If you ever have any suggestions about getting through this phase, please feel free to share them! Oh my I love your hair! I'm 41, so I'll get to experience the "pause" still. Uggg! Thank you for the compliment on my hair. :) I'll be here for support whenever you go through, Alissa! LOL! Thanks for stopping by. Okay, I personally believe if you dyed your hair & no grey hair you'd look like you're in your late 30's. Seriously, you have such beautiful skin & a beautiful face... no wrinkles...oooooooooo I hate you! ~snicker-snicker~ I'm 68 & I wish I looked as good as you! YOU GO GIRL!!! Awww,thanks Marie. I can't believe you're 68! YOU go girl! But, I will never dye my hair again. LOL Too much trouble. Thanks for stopping by! I had terrible 'symptoms' for about 3 years (klunk, duh, slapping my own head). Finally when I couldn't walk across the street or up a flight of stairs anymore, I went to the gynecologist and told her what was going on. She did a test right then and there and sent me immediately for an emergency hysterectomy. My blood was so so low. They didn't have enough of MY type of blood in the surgery room, so I used one pint of someone else's type, and was still, and remained, one pint short. No matter...the second I got out of surgery, I felt a million years better (and younger). All that time I thought it was 'part of life' or peri/meno... and never even thought to explain it to my Dr. Crazy, right? In any case, I totally feel ya when it comes to symptoms. Definitely no fun at all! I think every person is different, and to be truthful, it wasn't so bad the 6 1/2 years I was in Perimenopause. I think it's just going to take some getting used to for me and tweaking a couple things. But, I'm not gonna lie. There have been several times I said I'd rather have my period every month. Thanks for stopping by! I didn't have hot flashes, just warm flushes. Me too! And not very often. It's definitely not my main complaint. Thanks for stopping by Colleen! I think it definitely affects each individual woman differently. You could end up being one of the lucky ones who glides right through with much ease! Thank you so much for your kind words. 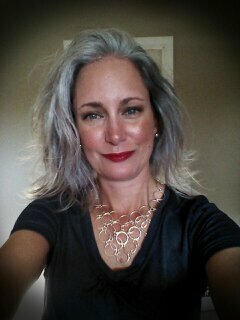 :) Going gray was one of the best decisions of my life.